Greg and I would like to thank everyone for their support through a very tough month. We’ve been asking for thoughts and prayers on social media, and I wanted to offer a summary of what’s been going on with Hazel. 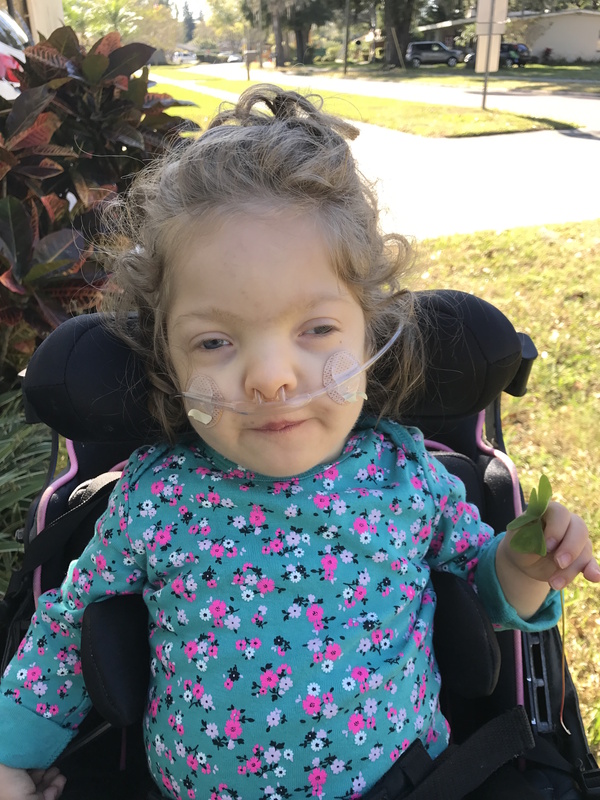 On January 9th, we went in for a sleep study to see if the tonsillectomy/adenoidectomy reversed Hazel’s severe sleep apnea. However, instead of the apnea improving, it was much worse! Her oxygen was dipping very low, and she was holding her breath while awake and have central apneas while trying to fall asleep. They ended up putting a bi-pap on her during the study because she was desaturating in oxygen so often and so low. She only slept 20% of the time, so it’s hard to say if that’s at all close to a real representation of what she actually does at night. We started monitoring her oxygen levels at all times. We knew she developed a behavior of breath holding and heavy breathing while awake, and thought it was due to taking her off her anti-epileptic meds back in the fall. We discovered that her oxygen was not only desaturating at night, but through out the day as well. We don’t know if this breath holding is a learned behavior or an involuntary neurological action. So we started her back on her anti-epileptic meds to see if that helped. We also started using a bi-pap at night to help her sleep apneas. After four very stressful nights on the bi-pap, she started having partial/focal seizures. They’d last about 30 seconds on average. Her left side of her face would scrunch into a grimace, her breathing would stop, and she’d twitch in her arms and legs at times. It was very scary, and was happening between 5-10 times a day. We upped her anti-convulsants and hoped they would control the seizures. After four days of no seizures, she had three more intense seizures on Jan 30. We decided to have an overnight EEG to get a picture of what’s going on in her brain. 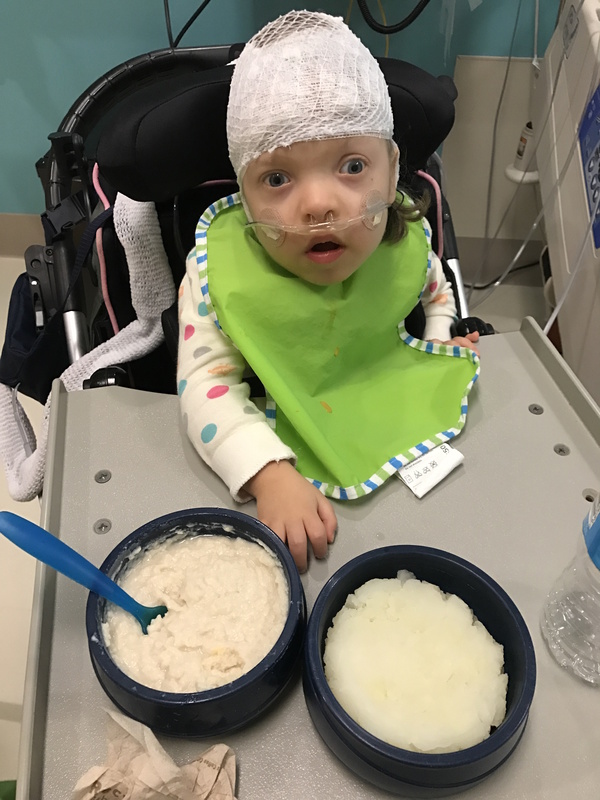 The extended EEG showed no seizure activity, although her EEGs are always abnormal. Even on anti-convulsants, she has sharps in the left temporal lobe of her brain. She showed runs of rhythmic activity that were potentially building to a seizure, but after 10 seconds they leveled out. We discovered that her apneas are not caused by seizures, but we are still left with questions on why they have become worse. Our next steps are to see her pulmonologist on Monday. Our main concern is to get her apneas and desaturations under control. We follow up with an epileptologist in a few months. She has not had a seizure (knock on wood) since Jan 30. Our current plan of care is to keep her on oxygen 24/7. She wears a pulse oximeter that alarms if her oxygen dips below 89%. Her apneas are somewhat manageable at night. She seems to have the apneas while falling asleep at bedtime. When we hear the alarm, we gently awake her to get her to start breathing again. After she finally falls into a deep sleep, she doesn’t have an apnea unless she’s aroused out of deep sleep…and then the cycle starts over again. She has not been back to school since the sleep study. We will probably keep her home for the rest of the semester, and have applied for skilled nursing to help with her care at home. I am so thankful to have this equipment that helps us monitor her breathing. I’m so thankful that we have good insurance that covers the cost of oxygen, bi-paps, pulse oximeters, etc. And I’m most thankful for the outpouring of love and support that we have received from our friends and family. Thanks so much! We are currently fundraising for awareness initiatives to get more researchers interested in studying BOS. We hope to have a research fund started this summer, to help support the scientists in their search for the best treatments of BOS. This entry was posted in Uncategorized on February 4, 2017 by Carrie. Jullie zijn fantastische ouders, die maar blijven vooruit kijken om het leven voor jullie lief meisje beter te maken. Het maakt me verdrietig dat Hazel door zo een zware tijd moet gaan en jullie ook. Ik herinner me nog goed aan het gevoel, toen mijn zoontje aan de monitor lag. Altijd gespannen de volgende alarm afwachtend was zenuwslopend. Alhoewel wel wetend dat de monitor helpt om ergers te voorkomen. Maar ik ben vol vertrouwen dat jullie het samen voor elkaar krijgen om antwoorden op al de vragen te krijgen. Heel veel sterkte en kracht toegewenst!